The Bureau of Labor Statistics (BLS) released the Producer Price Indexes (PPI) for March, reporting that inflation in prices received by producers (prior to sales to consumers) increased 0.2% in March after a string of monthly declines. The overall increase was led by increasing prices for energy, mainly gasoline. Prices for services rose 0.1%. Rising energy prices and any indication of positive inflation will be welcome developments at the Federal Reserve as deliberations over monetary policy continue (FOMC). With respect to building materials, prices for gypsum and wood products declined in March. Softwood lumber prices declined 1.6% in March following the same decline in February. Analysts at Random Lengths attribute the decline to an oversupplied market, citing a strong US dollar, weak demand from China, and disruptions at West Coast ports as factors. Prices have declined enough since the beginning of 2015 to trigger the tariffs and quotas outlined in the US-Canadian Softwood Lumber agreement for the first time since mid-2013. Prices for OSB continued their slide, declining 0.3% in March contributing to the reversal of most of the sharp run-up from 2012 and early 2013. 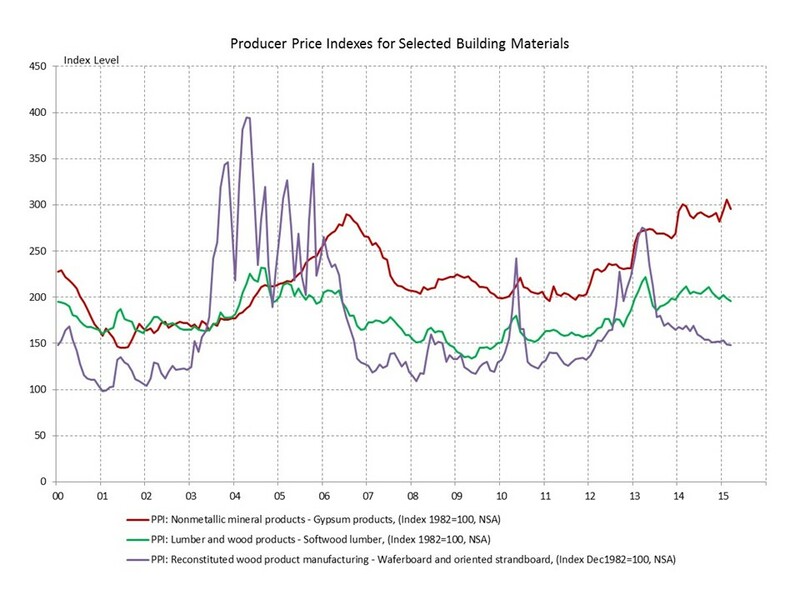 The PPI for OSB indicates a 46% decline from the price peak in March 2013. Wood products traders believe prices for both framing lumber and OSB can fall further before producers reverse decisions about the newly revived capacity responsible for recent price declines. Prices for gypsum slipped 3.2% in March after gains in January and February. Even with the March decline gypsum prices remain comfortably (and inexplicably) above housing boom highs in comparison to prices for wood products and the industry adjustments made for those materials.